CDV USA has announced that the English-language release of Divinity 2: Ego Draconis will be landing on North American shores in December, just in time for the holidays. Divinity 2: Ego Draconis is the third chapter in the Divinity series of action-RPGs based in the mythical land of Rivelllon. Players begin the game as a Dragon Slayer, ridding the land of the fabled beasts, but as the game progresses they will discover their true power as a legendary Dragon Lord, able to assume the form of both humans and dragons as they quest across the massive dungeons and great outdoor spaces of the war-torn land. "Divinity 2: Ego Draconis is a perfect fit for the North American market, and we are very excited to be publishing it," said CDV USA Chief Executive Tom Gross. "Larian Studios is a well-respected developer and for this reason we are very glad to be able to expand our US line-up this holiday season with such a fantastic product." Ego Draconis is the follow-up to Divine Divinity, the 2002 RPG from Larian studios, and its 2004 semi-sequel Beyond Divinity. While neither game is particularly well known in North America, Divine Divinity gained something of a cult following among PC gamers for its huge, wide-open world and depth of gameplay; Beyond Divinity, unfortunately, dropped the ball a bit and did not fare as well with critics or fans. 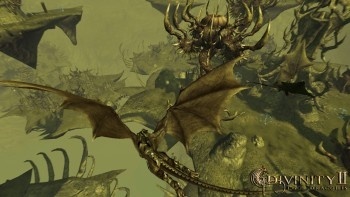 Divinity 2: Ego Draconis is being developed for the PC and Xbox 360, and is expected to be in stores for December. More information is available at divinity2.com. I find it strange that Poland manages to make an award-winning RPG that hit the shelves in both Europe and NA at the same time, yet a German H&S has to wait half a year for that. Divine Divinity was really a very good game and it's a shame it was so widely overlooked in North America. I think a big part of the problem was the name, because it's pretty bad. Maybe it sounds better in French or German or whatever, but in English it just says, yo, bad translations within. I think the 360 version just came out here, the PC version was out much earlier. I was surprised to see it's been developed for the 360 as well but maybe that'll help Larian breath through with American audiences. I'm still on the fence a bit because of Beyond Divinity but if Divinity 2 is up to the level of the original, maybe the franchise and the studio will start to get a little recognition over here. Though I loved the first one, the assuming the form of dragons and humans thing seems a bit gimmicky. I'll wait until its out before I judge it.